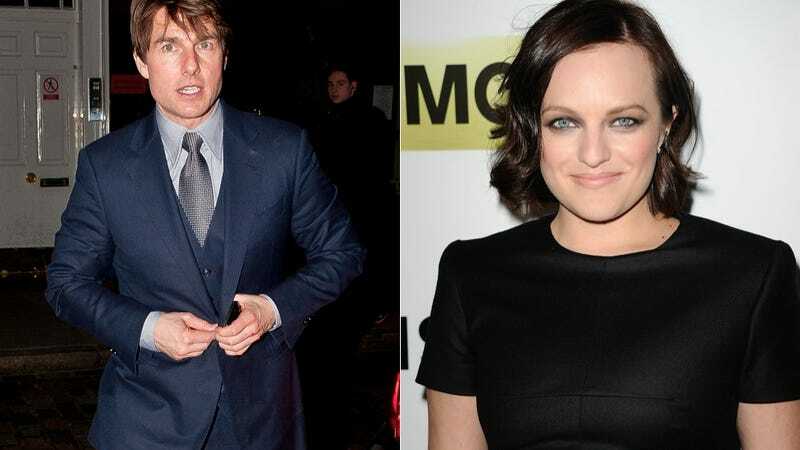 Celebrity gossip mongers are reporting that Tom Cruise is scouting Elisabeth Moss for his next Scientology girlfriend. This potential match sounds like the worst idea ever. Enter Elisabeth Moss. She and Tom aren't dating yet. Elisabeth is a 2nd-generation CO$ member. She's been giving lip service to her "traumatic" marriage experience that ended a few years ago. Tom was certainly traumatized at being dumped by Holmes. This could be the beginning of a beautiful … something. More like the beginning of Elisabeth Moss's ruined prospects. Mad Men is in its final season, so now is crucial time to use her Peggy Olson (and Top of the Lake) momentum to transition into other roles. We all know what happens to a Tom Cruise Wife's career. Nicole Kidman's took off after their divorce, and Katie Holmes' still hasn't recovered. Not to mention that being the companion of Xenu's most famous follower sounds terrifying. Remember poor Nazanin Boniadi? Who has also had high-profile roles on Homeland and Scandal AFTER she was allegedly punished for not measuring up by having to scrub toilets and dig ditches? Whatever Fred Armisen put Moss through, I'm sure that's not a step up. As the Enquirer reported, the aging actor is sensitive about appearing over the hill and feels a younger woman would help him with younger audiences. Sources also told us that Tom even resorted to accompanying his 19-year-old deejay son Connor to clubs in a mostly futile effort to meet women. But pals are optimistic that things could work out with Moss — especially since she shares his beliefs. Cruise admitted in court papers that ex-wife Katie filed for divorce at least in part so that Katie and Suri could leave Scientology, "But since Lizzie is a Scientologist, there would be no issues about raising a child in the church," noted the insider.